A pretty strawberry dessert that is easy to make. 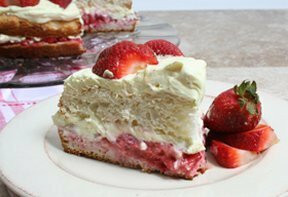 This Strawberry Lemon Shortcake is an attractive addition to any table for Mother's Day or for any special occasion. Mother will love this scrumptious shortcake served as is or with a scoop of ice cream. See how to clean, slice and dice strawberries to use in any of your favorite strawberry recipe for Mother's Day. Surprise mom with her favorite double crust pie for a special Mother's Day dessert. See step-by-step instructions on how it is done.